You may find that some photographers are reluctant to give out their prices on the web, and even on the phone. Some break prices into components that are confusing and hard to piece together. Well, not us. The price you see for the sample packages below is the price you pay. And, note that these packages can be tailored to your requirements and budget and we are happy to help and advise in delivering what you require. All photography collections are inclusive of full wedding photography coverage, together with Compact Discs containing proof versions of all the photographs taken by Ronan on the wedding day. These CDs are yours to keep. Proofs could also take the form of photographic contact prints if required. Sample CDs and contact prints are available for you to decide which you prefer. More on proofs. We can also post, free of charge, all your pictures on our website for you to share with family and friends worldwide which can be password protected if required. For the Platinum and Diamond Collections we usually provide a mix of formal/traditional pictures and informal/ candid / reportage pictures. The proportion of formal to informal pictures is entirely up to you. It's really important that we get to know your requirements - that way - you'll end up with the album that you dreamed of. Click here for details on how to make a booking. On your wedding day, Ronan will attend the bride's home for those special pre-wedding family photographs (if required), the groom's party arriving at the Church, the Bride's party arriving at Church, after the ceremony at the Church, a "stop-off" at a local beauty spot with the bridal party (if required), and family and bridal portraits at the reception. 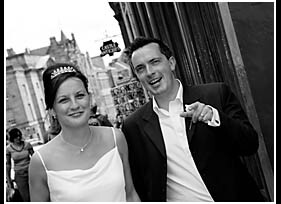 Approx 150 photographs will be taken on your big day, including a number of "reportage" or candid style, from which you choose a minimum of 36 fully finished prints to be mounted in your choice of quality album. This collection offers the ultimate in photographic coverage for your wedding day. It includes many more "reportage" or candid style pictures than the above collections. 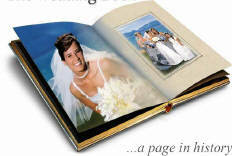 After the wedding, we will help you select from the proofs, prints to create a stunning and totally unique album, mixing colour and black and white photographs to maximum effect, designing each page of the album with a variety of print sizes and styles, giving you an album that is truly "different". Ronan will attend the bride's home for those special pre-wedding family photographs (if required), the arrivals at church, after the service at both the church and reception and a "stop-off" at a local beauty spot (if required). Attendance can be extended to the evening party, the first dance, or any point the couple require. Approximately 200 pictures are taken on your wedding day from which you create an album of 36 pages of photographs, (pages are generally A3 size and each can include up to 6 pictures) mounted in your choice of quality album. We are happy to provide a sample for you to browse. With this option, you choose the pictures you want included in the book, then the layout and design of each page is done by a team of designers in Italy. Typically each page in the book contains a number of pictures. The book is then printed and bound by GraphiStudio. In addition to the main book, there is also the option of smaller copies, which are excellent for parents, family, friends etc. although these do cost extra. As the price of the book does vary slightly with the style chosen and any additional parents / family books required, we would need to discuss the exact requirements and prices, which would of course be guaranteed with absolutely no hidden extras.